With the help of Dual Strength and Fitness in Horsham, Pentagon wanted to see how many miles their manufacturing team could go to support the outstanding work of the Arundel based children’s hospice. 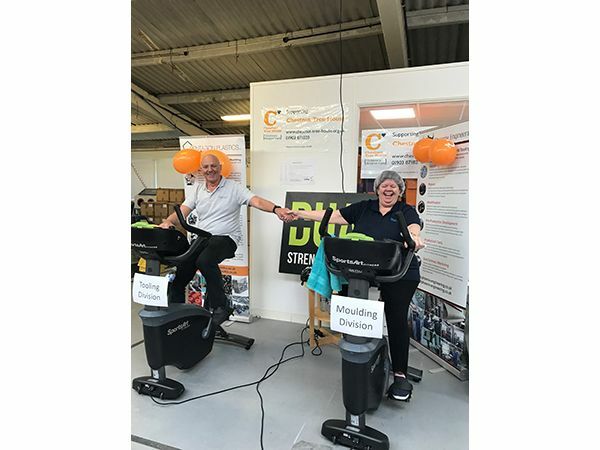 On March 12th and 13th two static bikes, courtesy of Dual where sited in the plastic injection moulding and toolmaking facility. Where the workforce was invited to hop on a bike and for every mile clocked up the company donated £2.00 to Chestnut Tree House. To add a little friendly competition, the staff were split into two teams the Moulding Division and the Tooling Division. Competition was rife over the two-day event as the teams showed great commitment to pushing the pedals. With lots of laughs and fantastic team spirit, Pentagon managed to cycle a massive 303 miles in total, with the Tooling Division just riding the furthest distance. Coupled with other business and staff donations the total raised for the event was £723.00. The work and care undertaken by Chestnut Tree House is truly breathtaking, supporting children and their families as they go through a life-changing journey together. Pentagon is proud to be able to support such an amazing charity and are looking forward to continuing their support.